NASA's Cassini spacecraft has measured a curious abundance of methane spewing into the atmosphere of Saturn's icy moon Enceladus. A team of American and French scientists published findings in Geophysical Research Letters suggesting two scenarios that could explain the methane abundance observed in the plumes. In 2005 Cassini's magnetometer and imaging data revealed the surprising existence of geysers in the south polar region ejecting water vapor into space. Scientists now believe that Enceladus harbors an internal liquid-water ocean under tons of icy crust, and that the plumes originate there. Analyzing the composition of the plumes, therefore, can provide a direct window to what is happening in the inner ocean. Cassini has since flown through the plumes, allowing scientists to determine that these watery geysers contain other volatile species, including hydrogen, carbon dioxide, ammonia, and methane. Volatiles are chemical elements and compounds with low boiling points that are associated with a planet's or moon's crust or atmosphere. "We modeled what would happen to those species in a subsurface ocean in Enceladus," said the paper's lead author Alexis Bouquet, a French graduate student at the University of Texas at San Antonio. "With high pressures expected in a subsurface ocean, clathrates could form and deplete the ocean of volatiles." Clathrates are chemical compounds where the crystal structure of one component contains another. For methane clathrates, water forms a hydrogen lattice framework that encases methane molecules. Large amounts of methane exist frozen in this form on Earth, both in permafrost formations and under the ocean floor. Cassini has detected silicate nanoparticles in the plumes, hinting that the bottom of Enceladus' ocean could harbor hot spots, with temperatures as high as 100 degrees C. In this scenario, hydrothermal activity could produce methane from rock-water interactions, similar to processes at Earth's hydrothermal ocean vents. High pressures in the cooler ocean waters then convert methane into clathrates. If the rate of methane production exceeds methane conversion, then the sea would be supersaturated with methane. This could explain the methane abundance in the plume. 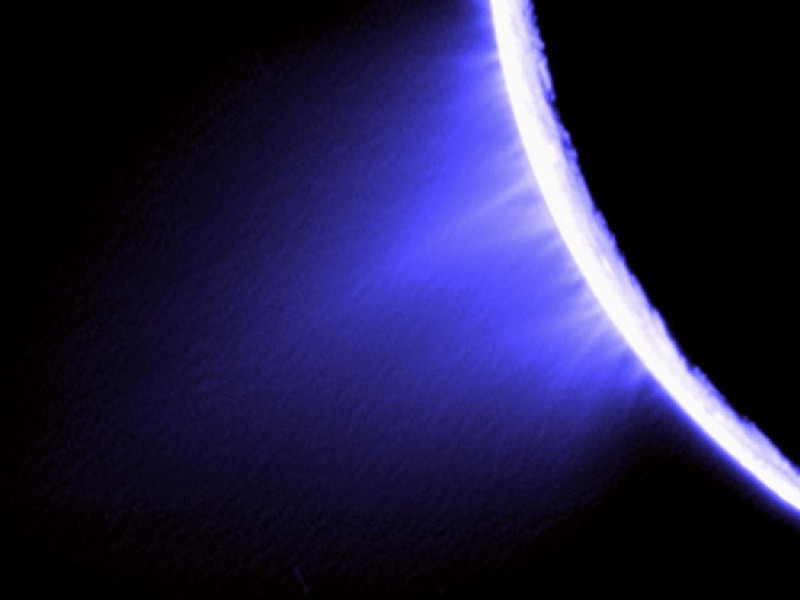 "Methane clathrate formation under conditions of the sea of Enceladus was so efficient the existence of methane in the plume of Enceladus was surprising," said Dr. Hunter Waite, a program director at Southwest Research Institute's Space Science and Engineering Division. Waite is the principal investigator for two Cassini spectrometers and serves as Bouquet's adjoint faculty advisor. "We originally had no idea that studying the formation of clathrate hydrates in the seas of Enceladus would lead to a conclusion that methane was actively being produced by hydrothermal processes at the rock-water boundary of the sea of Enceladus," Bouquet added. "This is highly suggestive of an Earth ocean analog, where early life formed in hydrothermal systems capable of producing methane." A second scenario examines the normal ice formation/melting cycle, where methane is released into the ocean from melting primordial ice. High pressures convert it into methane clathrate, which percolate to the surface. This mechanism, though, involves a complicated process of methane clathrate formation and efficient transport in an expanding interior sea. "In this scenario, as methane clathrates migrate to shallower depths, the methane is released in the same manner as carbon dioxide in a champagne bottle popping a cork," Bouquet said. "This gas saturation could expel water, helping create the methane-saturated plumes sampled by Cassini." Through their modeling, the authors concluded that the volatiles observed in Enceladus' plumes may be involved in the process of plume formation, through dissociation of clathrates or the presence of large amounts of hydrogen. The authors agree that both scenarios are likely occurring to some degree. More modeling of the ice-sea interaction and internal ocean dynamics could determine which mechanism is most significant. Growing evidence for internal hydrothermal activity — indicated by the presence of salty ice grains and silicon dioxide nanoparticles — favors the hydrothermal scenario.